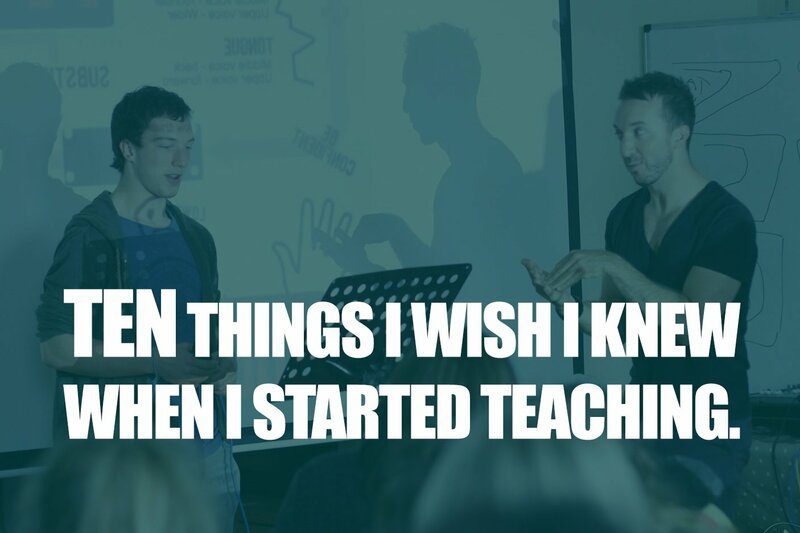 Ten Things I Wish I Knew When I Started Teaching. – a 4 minute read. In 2006, I took a trip to London to attend a vocal pedagogy workshop with American vocal coach John Henny. Little did I know that that would define the next ten years of my life. Up to that point, I had spent a few years within the teaching environment helping at kids groups, and had been guided by some very influential teachers myself: rewind to my secondary school maths teacher Mr Rose all the way through to my first singing teacher Gareth Henderson at the age of 17. There were a few in between too. All of which had a massive influence on me and the direction of my life. The truth is though, I had little idea how to actually ‘teach’ and, more importantly, was clueless to the incredible lessons I was about to learn from embarking on this wonderful teaching journey. You don’t know everything. In fact, you know very little. You might pretend you know a lot for a little while to satisfy your self esteem, but try and get over this as quickly as possible. It doesn’t help anyone, including yourself. Just work towards one or two things that can be ‘your thing’. Knowing singing stuff (facts and information) and techniques is really cool and is fundamental in growing your confidence to start teaching. That, however, is approximately 10% of what you need to be a teacher. Knowing how to read and empathise with people is the other approximately 90% of what you need to be a teacher. Get good at that! People are motivated by different things and that especially means: they are not motivated by what motivates you. You know what twenty minutes practice can do for your student, but that doesn’t mean that they do. Or that they care. And that’s ok… it’s their life and not yours. Don’t get upset if people don’t do as you ask. Instead, get good at finding ways to motivate them. Most of the time, people just need your energy. Your positive energy, that is. People sing and have singing lessons for so many different reasons. For some it may seem obvious: “I want to be in the west end” or “I have an audition on the weekend and this song needs to be awesome”. For others, it may just be the thing that keeps them sane or a step away from ‘normal’ life. Underneath all these reasons you’ll find a theme though. Everyone is in fact just finding their way to be happy. Try and facilitate that in some way, within the hour or so you spend together, and a big part of your job will be done. Take a second to consider the variables of teaching and learning. We are talking about… different people, with different motivations, different backgrounds and influences, who behave in different ways and respond to different things: there’s no surprise that teaching is actually, pretty tricky. Don’t be so hard on yourself. Due to #6, some people will come, some will go. Some will stay with you for a lifetime. It doesn’t mean that you’re not good enough or that you’re a horrible person. I mean, if you are the latter… sort that out. There really are enough singers/clients/people (whatever you want to call them) to go around. Do not become defensive or protective. People don’t own people… even ‘students’ who have temporarily joined you on YOUR journey have their own path to follow. As a matter of fact, make it a priority to encourage students to meet people with different areas of expertise and experience. Truly though, what goes around comes around and as one student leaves, another will come. If you invest your energy (thoughts, time and actions) in something and you are a good person, you will receive what you wish for. If you want to build up your teaching diary, invest in that and people will come. If you want to travel the world meeting singers, invest in that and before you know it you’ll be on an aeroplane. If you want to see happy students… you know the drill. A lot of people just like to be told that they are doing great. It is, sometimes, that simple. Here’s to the next ten! I can’t wait to see what I’m going to find out this time round. Are you a teacher? Would you give your younger self any advice? I’d love to know below or on my Facebook page. Next PostWould Life Be Better Without WhatsApp?